Rich soil that retains moisture well. Full sun in cool climates; partial shade where summers are very hot. Lovage is a hardy perennial that survives winter even in very cold climates. Topdress the soil around the dormant plant with rich compost each winter. Start with a purchased plant, or start seeds indoors and set out at about the time of your last frost. Lovage will reach its mature size in about three years. One plant is usually sufficient, but it’s a good idea to start a new plant every few years. At maturity, lovage will need a 3-foot (90 cm) square space. It is a very large herb. Because of its 5-foot (1.5 meter) height, lovage is best located at the edge or rear of the garden. Tender young growth has the best flavour. In summer, consider pruning plants back to force them to push out a flush of new leaves. Gather sprigs as needed in the kitchen for their celery flavor. Freeze extra leaves by covering chopped lovage leaves with water in ice cube trays. Remove flowers should lovage produce too many unwanted seedlings. 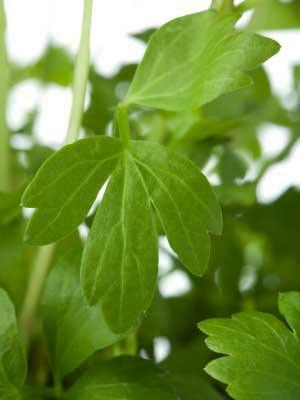 Or, gather lovage seeds and use them in cooking as a substitute for celery seeds.